There is only one way to make these fabulous 50s Clarissa Peeptoe Pumps in Cream and Gold even more perfect... by adding some jewels! Luckily, Ruby Shoo felt exactly the same way. 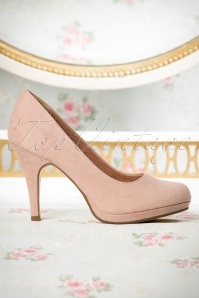 Because these elegant peeptoe pumps are embellished with floral appliqués, a faux pearl and rhinestones... very chic! 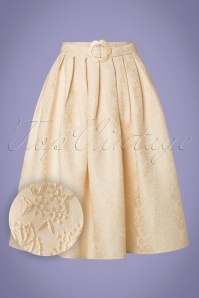 Made of cream-coloured brocade with elegant flowers, finished off with a gold toned trim. But they don't just look great, the soft insole also ensures a comfy fit. These little gems are the perfection addition to your shoe collection!